Welcome to October, the month dedicated to us being in our ENOUGHNESS! OK, so yes, I made this word up… but doesn’t it make sense? With so many things in the world right now telling us how we are NOT enough, I just feel compelled to remind us that we are full of enoughness. It feels like every day someone is telling us we aren’t enough, some advertisement is telling you we aren’t enough, some door closing makes you feel we aren’t enough, some thought drilled into our heads tells us we aren’t enough… How can we dare to be courageous and want to grow if we are stuck in our feelings of not being enough? 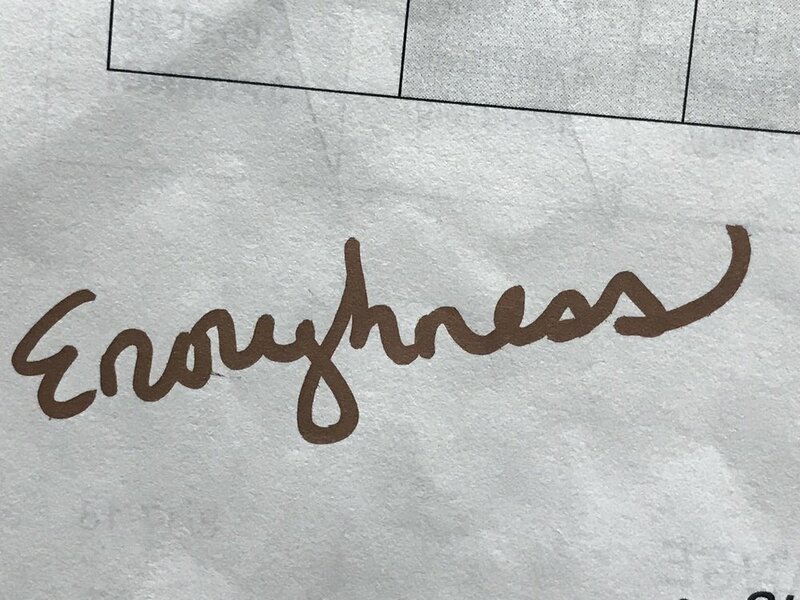 So what is it, to be in your enoughness? It’s the simple truth of stripping back all the extra B.S. and starting with what you have. Look at your hand and say: You are enough. Look at your knee and say: You are enough. Look at your hair, yes your hair, and say: you are enough. Whatever you got… it’s ENOUGH! Now that’s just on a physical level… How about spiritually? Close your eyes, notice who is noticing you… and say “you are enough”. To whoever is your spirit guide… THANK YOU for always knowing that you are enough! The truth is, we have 3 months left of 2018, so October feels like as good a time as any to dedicate to our enoughness. Shall we? As usual, comment below… reminding each other of your enoughness! Marination Station: when things get rough, and your head goes on a loop, ask your spirit guide, source, universe, whatever you know is higher than yourself and ask them to send you reminders of your enoughness. And then pass it on!! Let’s do this!